Elder Aaron Davis: When I first came to Los Angeles, it looked like just this mass of dots... all jumbled and disconnected. It was pretty disorienting. Latter Days touched me unexpectedly in many ways. I knew little about the film before I saw it on DVD, and really had few expectations. I am no movie critic, and probably see fewer flicks than most people. But I know what I like, and I know when something tugs at my soul. Few movies exist that I have wanted to see more than once. This is one, and I highly recommend it to anyone who is soulsearching. Maybe it is stereotypical, and maybe its not Academy Award material (I like few that are), but it really touched some hot buttons with me, and it moved me to tears in the end. I thought that Cox and company did a great job summing up such deep subject matter in such a short time. For those who think it's hoaky, I say relax, its just a movie. I lived many parts of the real-life version of this story, and it wasn't always pretty. While never a Mormon, I have "wrestled with the angel" for most of my adult life, still trying to reconcile my gay being with my spiritual being. Long-term denial of my sexual identity at an early age led me into a lengthy struggle with drugs and alcohol and a near-death experience 11 years ago. I even looked into aversion therapy once as a way to "cure" myself from homosexuality. Trust me, its better to see this unfold in a movie than to have lived it. 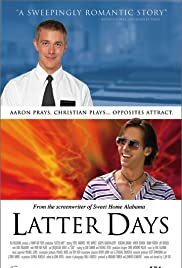 While it may be steeped in stereotype and clichés, as many critics have suggested, Latter Days manages to expose many shallow traits among the major elements in this story: organized religion, gay culture and even Hollywood itself (I love how Cox portrayed L.A. as an additional "character" in the movie). 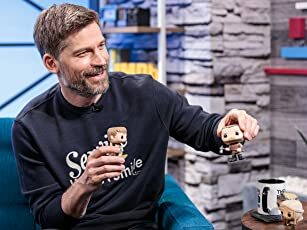 I thought that the acting was terrific, especially Sandvoss as Aaron Davis. The music is as touching as the story (I recommend the soundtrack too). I can't speak for most moviegoers, but this one will stick with me for a while, and few ever do. 108 of 122 people found this review helpful. Was this review helpful to you?